Sweet Potato Has 10x More Vitamin A Than White Potato And Is A Natural Painkiller! You might find it strange, but sweet potatoes do not belong to the same family as potatoes since they are actually roots. There are many varieties, and the shapes and sizes of the sweet potatoes can range from short to long, while their flesh can vary from white, yellow, orange and purple. Sweet potatoes are abundant in carotenes, which are precursors of vitamin A, which improves the eyesight. They are also rich in vitamins C, B2, B6, E and biotin (B7), minerals like iron, copper, folate, and manganese, dietary fiber, and pantothenic acid. Sweet potatoes are full of plant proteins and very low in calories. They contain twice the fiber, twice the calcium and over 1000x more vitamin A (beta-carotene) than white potato. “First of all, the sweet potato belongs to the morning glory family of plants while yams — not to be confused with Mexican yams or wild yam — are actually related to lilies and grasses. Additionally, sweet potatoes are thought to have originated in Central and South America while yams are native to Africa and Asia. There are also some significant differences in the appearance of the yam vs. sweet potato as well. Sweet potatoes have tapered ends with smoother skin and can range in color from white to vibrant orange and purple. Yams, on the other hand, have rough skin and are typically white-fleshed and cylindrical. 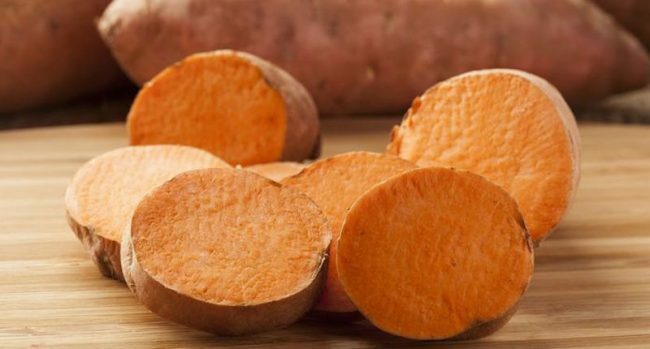 Yams are also more starchy and dry without the hint of sweetness found in sweet potatoes. Anti-inflammatory: They are rich in beta carotene which soothes pain and fights inflammation. Immune system: Their regular consumption strengthens the immune system and prevents infections. Heart diseases: Sweet potatoes are rich in potassium, which regulates blood pressure, improves the function of the heart and maintains fluid and electrolyte balance in the body cells. Muscle cramps: The high potassium content relieves muscle cramps, energizes the body, and prevents injuries. Diabetes: Sweet potatoes regulate blood sugar, and stabilize and lower insulin resistance. Emphysema: Smokers and people who inhale second-hand smoke are advised to consume foods rich in vitamin A in order to prevent its deficiency in the body, which can lead to lung issues. Fetal development: The high folate content is essential for healthy fetal cell and tissue development of the fetus. Antioxidants: Sweet potatoes are full of antioxidants, which fight inflammatory problems like asthma, arthritis, gout, etc. Digestive tract: They are loaded with dietary fiber, which improves digestion, prevents colon cancer, and relieves constipation. Stress: In the case of stress, the metabolic rate increases and lowers the potassium levels. Their regular consumption rebalances the vital mineral and normalizes the heartbeat. When buying your sweet potatoes, choose the darker varieties, as they are richer in carotene. Also, make sure they are not wrinkled or soft, and avoid the ones with a green discoloration that indicates the presence of a toxic substance called solanine. Store them in the open, in a cool, dark and well-ventilated place. When preparing them, do not peel them, as the peel is full of nutrients. You should just scrub them with a vegetable brush, and add them to various dishes. Note that you will make their nutrients more available if you cook them by steaming, boiling, or baking. Start consuming them more often and you will experience amazing health improvements!